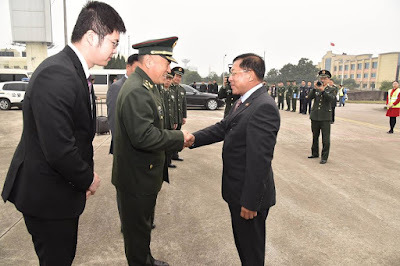 YANGON — Myanmar Commander-in-Chief Sen-Gen Min Aung Hlaing left Naypyitaw for China on Tuesday, at the invitation of Gen Li Zuocheng, chief of the joint staff department of the central military commission. He plans to meet with senior officials from the People’s Liberation Army (PLA) while visiting China’s military training institutions, said a report issued by the office of the Commander-in-Chief on Tuesday. The delegation led by the army chief includes senior military officials from the office of the armed forces. On Sunday, Snr-Gen Min Aung Hlaing met with Chinese Foreign Minister Wang Yi who was in Naypyitaw for an Asia-Europe Meeting for foreign ministers. The Chinese minister also met with President U Htin Kyaw and State Counselor Daw Aung San Suu Kyi separately on the same day. During the meetings, Wang Yi suggested a three-stage path for Myanmar and Bangladesh to work out the Rohingya crisis—ensuring a ceasefire and restoring stability, talks between the two countries to create a workable solution for repatriation, and poverty alleviation as a sustainable solution. In the past three months, more than 600,000 Rohingya Muslims have fled to Bangladesh after the Myanmar military began clearance operations following an insurgent attack on 30 security posts and an army base in Rakhine State on Aug. 25. But the Myanmar government has denied those figures. According to Xinhua Myanmar’s report, Wang Yi said during the meeting with the commander-in-chief that China prioritizes Myanmar in its foreign policy and that the Myanmar military plays a crucial role in China-Myanmar ties. Myanmar’s commander-in-chief said he supported China’s three-stage path for resolving the Rohingya crisis, Xinhua Myanmar reported. Snr-Gen Min Aung Hlaing expressed his gratitude to China for “its stance on and support for Myanmar” regarding the conflict in Rakhine, the office of the commander-in-chief said in the statement. The Office of the Commander-in-Chief did not state how long the visit would be. The armed forces chief has visited China twice; in November 2016 and in 2013.